On my triathlon support group someone asked about gear ratios and I wrote out this whole thing for him explaining how to calculate them. Since I'm afraid I'm going to lose my original chart and/or forget how to do it in the future, I'm going to post a copy here. This site may soon become a place I list nuggets of triathlon advice in addition to chronicling my weight-loss journey. Hopefully one doesn't take over the other. That gearing website is over my head as well but I once took a gear class/talk/thingamabob and they greatly simplified the whole thing for newbies like me. Essentially the guy taught us how to rank our gears from lowest to highest, across all three chainrings/cranks/cassettes/whatever they're called (the name escapes me now). Out of the 30 gears I have on my bike (3 in front x 10 in back) I was able to rank them in order and can now shift more smoothly in that I don't skip gears when shifting going uphill and get less tired overall. Here's how...it involves a lot of counting the cogs on each ring, so beware. Unless you're a good Googler, that is. Figure out how many cogs are on each of your rings, both front and back. Usually for the front that's given in the specs for the bike (mine's 50/39/30) and for the back they give you a range (mine's 12-27, 10 speed). You can either Google that particular cassette/rear gear rings by getting the name and range off the specs website for your bike or get on your hands and knees and count them all. I recommend the latter, but I know it's not always possible. Oftentimes you can also guesstimate the spacing between the gears in the back. Steve is much better at that than I am. For each gear, divide the number of cogs from the front gear by the number of cogs on the back gear, and multiply the whole thing by wheel size. 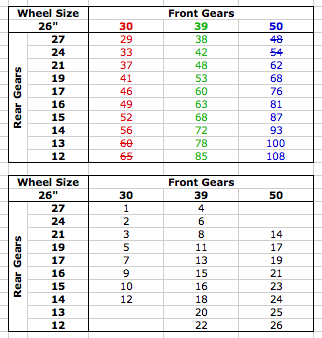 For the purposes of ranking your gears relative to each other, you don't have to multiply by the wheel size, since the order of gears comes out the same regardless. I still multiplied since it gave larger numbers and was easier to compare and rank them later. For example, for my fastest overall gear (largest front gear, smallest back gear) and what I thought were 26" wheels at the time, I did the following: 26*50/12 = 108 and do that for all your other gears as well. You don't have to convert your wheel size to metric. Or you can multiply by some random number to take care of the decimals. The important part is divide the front gear by the rear gear. Remove two gears with smallest front/smallest back and smallest front/2nd smallest back, and two gears with largest front/largest back and largest front/2nd largest back from your chart, for a total of four gears removed. You should never be riding in those gears since in those combinations, the chain is diagonal across the gear rings which is not good for either or the chain and grates on the components. So avoid at all costs. Rank your resulting numbers from highest to lowest, with the lower numbers being lowest/slowest gears (granny gears) and higher numbers being highest/fastest gears (downhills). So the granny gears (smallest front, largest back) would have low numbers and the gears for downhills (largest front, smallest back) would have super high numbers. Write it all out on a piece of paper and tape it to your handlebars. It really helps on the uphills especially with knowing into which gear you should downshift so as not to skip gears. Makes the climb smoother and more effective, in my opinion. Below is my gear chart. The multicolored chart and numbers are the result of the formula I mentioned in #2 above: wheel size*front gear cogs/rear gear cogs. And the bottom chart is the ranking of the gears from slowest to fastest (granny gears to downhill gears). As you can see, I've crossed out the four gears I mentioned in #3 that you should never use and didn't include them in my rankings. The numbers for the front and rear gears correspond to the number of cogs on each ring. I've taped a little index card with the bottom chart info on my handlebars and try to shift in order. It's especially useful on uphills when I feel like I'm shifting too quickly or the one I'm in is just a tad too hard so I downshift and all is well. It's taken a little getting used to in figuring out what gear I'm actually in to be able to see where to go next, and I still find myself looking back at my rear derailleur quite often. So during normal flats or rolling hills I don't really stick with the gear chart too much and just do it by feel, and don't really care if I'm a little bit off. As you can see in the middle gears of the middle chainring, the numbers aren't that different (first chart) and thus changing gears from say a gear combo of 39/17 to 50/21 (ranking 13 to 14) is about the same as from 39/17 to 39/16 (ranking 13 to 15). Here is where having an accurate wheel size comes in handy because you can see that 13 to 14 is 60 to 62 (not sure about the units...inches, maybe?) and 13 to 15 is 60 to 63, so only a difference of 1 inch between the two results, but you're going from 13 to 15 in just one gear change as compared to 3 for 13 to 14. So in those middle gears sometimes it's not important to go in order since the differences are slight and you can skip a ranking without feeling too much of a difference in order to shift less frequently. Once you get to the granny gears or downhill gears, the differences are much more noticeable. Going from ranking 3 to 2 (30/21 to 30/24) is 37 inches to 33 inches, while ranking 3 to 1 (30/21 to 30/27) is 37 inches to 29 inches, a much bigger jump and thus a gear you probably don't want to skip. Also, on the uphills it's easier to know which gear I'm in since the terrain is not changing as often and thus I'm in the same gear for a longer amount of time, but also because the differences between the gear combos are so great that I can generally feel where I am on the cassette. Overall, this has been really helpful in getting myself to ride in the proper gear and thus making my riding more efficient and smoother. I would highly recommend making a chart of your own.